Beyond pills and chews, Country Life® now offers you a great tasting, smooth melt. To help promote relaxation and mental calmness, this mint-flavored L-theanine melts quickly in your mouth. 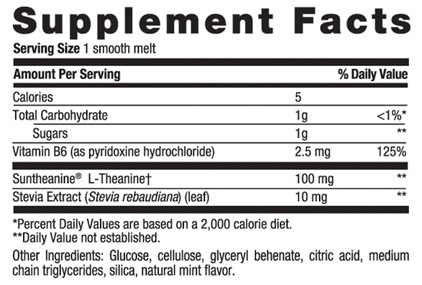 Country Life® uses only Suntheanine®, a form of L-theanine with over 50 studies and patents. RECOMMENDED USE: Adults take one (1) smooth melt daily and allow it to melt on your tongue before swallowing. This product can be taken with or without food.